So...sorry about last week. And this Tuesday. Not sure what happened. But now we're back with a lovely post by Lydia. Seriously. Don't get hung up on research and the nitty-gritty's. I say, my dear writer, hammer out an opening line and dive in. You can change it later. For the moment, it's easier to work with something, no matter how terrible, than trying to work from scratch. Great things rise out of first draft confusion. But to help you along, here's some raw advice from a writer whose barely begun to figure it out. This goes along with research (and that's next), but it's slightly different. The parts of setting come first so you know what to research. There are many factors that determine setting. Where does it start? What is the location much of the story happens in? Think of Dickens. Many of his works are set in London, which plays a defining role in the mood. What is era-appropriate? Theme and names are important to consider. A good example of this is the follow your heart trope, something that turns up often in Historical fiction. (Especially that featuring independent young women.) 'Follow your heart' is a mindset that has only become a popular and acceptable in the last 50-100 years. Even if that's how your character -and you-really feel, you may want to call it something different for the sake of accuracy. Delve into the matter a little deeper and look for specifics. Is your character following their heart, or trying to survive on the streets? (See: Oliver Twist) Or find their identity? (See: Elnora Comstock in The Girl of the Limberlost.) Trying to follow the crowd drew her deeper into her love for nature. She didn't change fundamentally. This has the potential to add a new facet to your story. I used a variation of it myself. The MC in my novel isn't following his heart as much as he's seeking approval from his family to use his talents on stage. Oh, and, it's a He. Guys faced opposition for breaking out of the mold too. Remember that. Historical fiction needs more male protagonists. I can hardly think of a title that does. Do a LOT More Research. Okay. I love research, but some might dread this part. If that's the case you have three options: change, cope, or find another genre. Historical fiction is easier to write today than it ever has been. You can find a lot on the internet. But be wary of Wikipedia and other sources of common knowledge. Gain facts, but develop your own opinion. There's plenty of bias out there on history. Remember: Our view on a historical issue today does not change the past; it can only change the future. Mentioning definitive events is a good way to add currency and inform the readers of the exact era in history.For instance, you could say that Hitler just invaded Poland, even if your story isn't about WWII. Or that gold has been found in California, even if your story has nothing to do with that. Those are major events that definitely got around. It's a great way to ground your story in reality. Be careful. Not every world-shattering event has to be connected to your story somehow. Just as you probably didn't have a relative affected by the latest catastrophic event, your MC likely doesn't have a relative on the Titanic. Take a cue from some old fiction. What current events does the writer mention? Not a whole lot. The result is a focused narrative that doesn't distract the reader from the story with digression. I would love to see this mindset more in historical fiction. This part may be my absolute favorite thing to research. No matter the era, clothing never ceases to be interesting. Be careful not to go into overkill mode. Drop subtle hints about the costuming here and there. I had to restrain myself in this area, but I've found a fun way to do this is to share one character's thoughts on another character's outfit. And remember to keep it fitting to the time in history. A period piece I watched recently featured the young lady MC turning heads by riding astride in breeches. The movie should have been set a good thirty years later than it was for that to be the case at all, and I spent half the movie wondering if the producers had ever heard of split skirts. That almost ruined it for me. Just like in fantasy, names are important in historical fiction. They carry weight. Don't make your story cringe-worthy by accident. You may like that name. A lot. I understand. But using very modern names can push your reader's buttons and shed a bad light on you as the writer. This is a no-brainer for some, but everyone needs a reminder. Here's a good/fun/cool way to look into era-oriented language. Go to Google and type in 'define fumble' or 'define (Your Word Here)'. A box will appear that has entries like a dictionary or thesaurus. I use this prodigiously when I'm writing as it's ten times faster then either of those. At the bottom of the graphic, when you expand it, there's a graph that shows when the word is/was most common. Be on the lookout for minor details gone awry. Things in history are likely to slip past. I set a foxhunt in August, not reckoning that England has hunting-seasons. Other people might not realize that's an issue either. But assumptions can steal from your credibility. Lydia Carns writes historical fiction. She loves books, sugar, dresses, and music, and when she isn't writing, she is either in the kitchen baking, illustrating her books, and/or procrastinating on her blogging. She can be found on Pinterest, Twitter, Facebook, and of course, her blog, where you can read about her current projects, and life in general. Oh, thank you so much for posting this!! 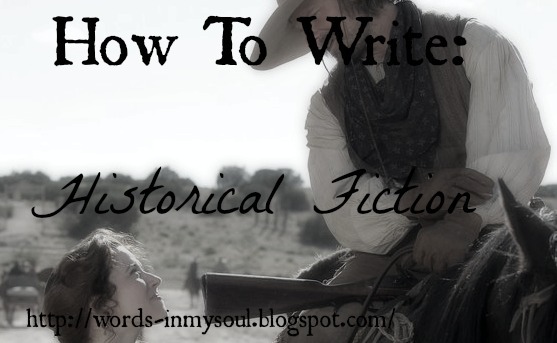 I am just starting writing my first novel which is historical fiction and these tips are really helpful. Thank you again and I love your blog!!! YOUR BLOG IS SO HELPFUL!